Hello Friends and Happy World Card Making Day! Today, I am sharing a card that I created for Lesson 8, which was to use one of the practice images on a card. I chose to use this sweet floral. I really like that all of the students were given the same images to use for class. I love going thru the Student Gallery and looking at all the beautiful artwork...so inspiring! I printed the image onto Neenah card stock and colored it with Copic markers. Then I fussy cut it out. I also went around the raw edges with a black marker to give the cut image a more finished look. I added dimensional adhesive to the back and set it aside. Next, I worked on my card base. It's a standard A2 size card. For my main panel, I selected two patterns from the Into the Woods 6x6 paper pad, from Lawn Fawn. I adhered them onto a piece of card stock and then trimmed it to size. 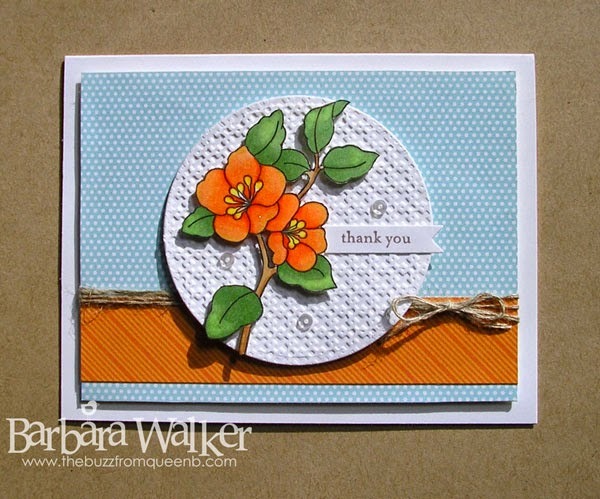 I tied on a bit of Stampin' Up! Linen Thread and mounted it onto the card base with foam tape. I wanted to have the floral stand out from the patterned papers, so after using an embossing folder on white card stock, I die cut a circle and adhered it with dimensional adhesive onto my main panel. 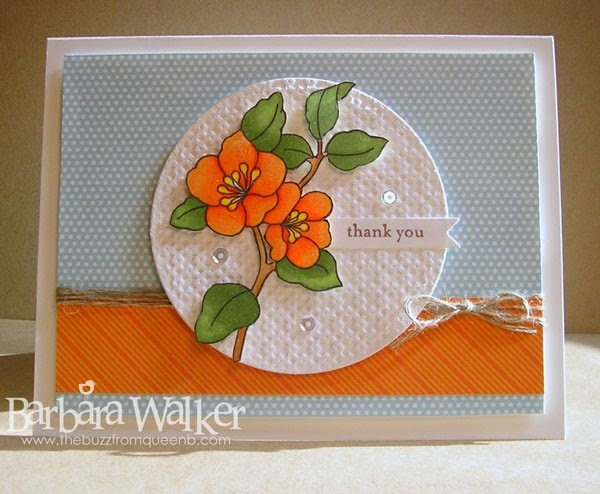 Then I adhered the floral piece and the die cut greeting tag. I added clear Wink of Stella to the floral and finished the card off with a few Sparkling Clear sequins from Pretty Pink Posh. I love my Wink of Stella glitter brushes. They are perfect for adding my signature sparkle! 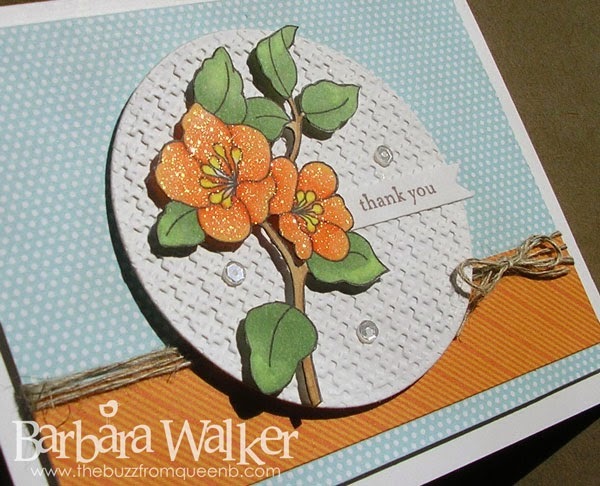 The embossing gives beautiful texture and dimension - it looks great behind your lovely, sparkly flower. Your DP has a nice look if texture also. And the thread and sequins finish everything off nicely. Beautiful coloring, Barb. Your flowers are lovely. I really like the texture in your embossed circle. It looks like just the right amount. The twine adds a nice rustic touch as well. I adore your sparkle. I must not have enough "schtuff" in my Wink of Stella brush as I never see that many glittery spots when I look at my projects from the side. Maybe I need to do something? Thanks for sharing your progress from class. Hugs! I love how you put this card together. I wonder if you're as addicted to Wink of Stella as I am. I want to put it on EVERYTHING!!! Thanks for sharing your work.